Multimedia educational material is also available on Frailty.net. 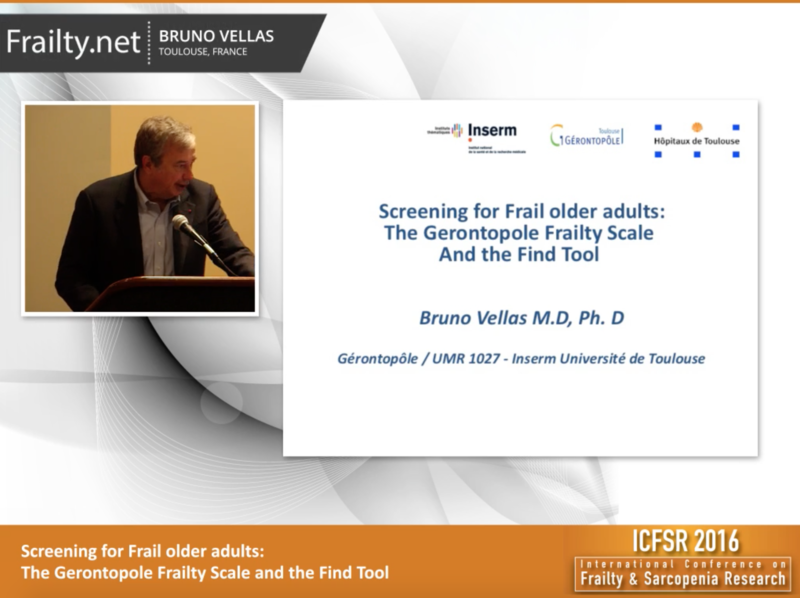 Discover various aspects of Frailty presented by international experts with a selection of videos selected by our editorial team. 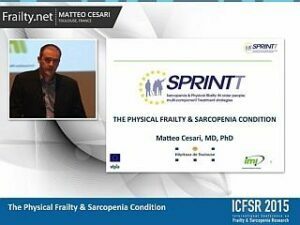 Introducing the 11th video presentation from the International Conference on Frailty and Sarcopenia Research In Philadelphia, 2016. Stephen B. Kritchevsky presenting: What about Fat? 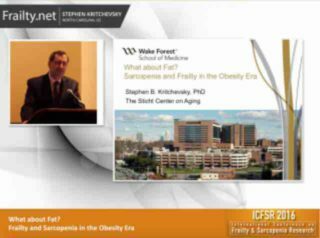 Sarcopenia and Frailty in the Obesity era. 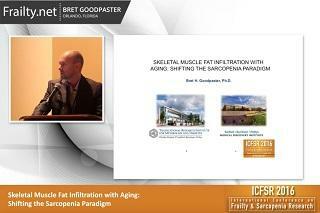 Introducing the 10th video presentation from the International Conference on Frailty and Sarcopenia Research In Philadelphia, 2016. 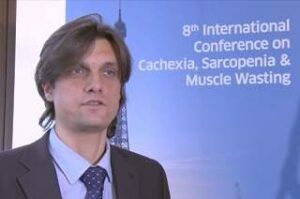 Gabor Abellan Van Kan presenting : Prevalence of Sarcopenia in frail older adults – Results from the Frailty Day Hospital. Introducing the 12th video presentation from the International Conference on Frailty and Sarcopenia Research In Philadelphia, 2016. 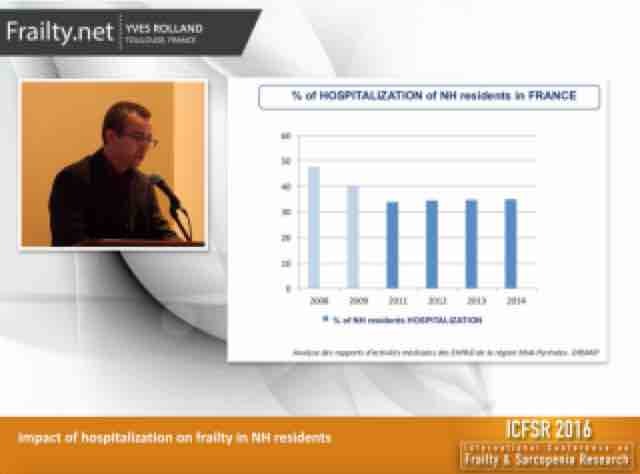 Matteo Cesari presents: Frailty Index in nursing home – Results from the INCUR study. Introducing the 5th video presentation from the International Conference on Frailty and Sarcopenia Research in Philadelphia 2016. 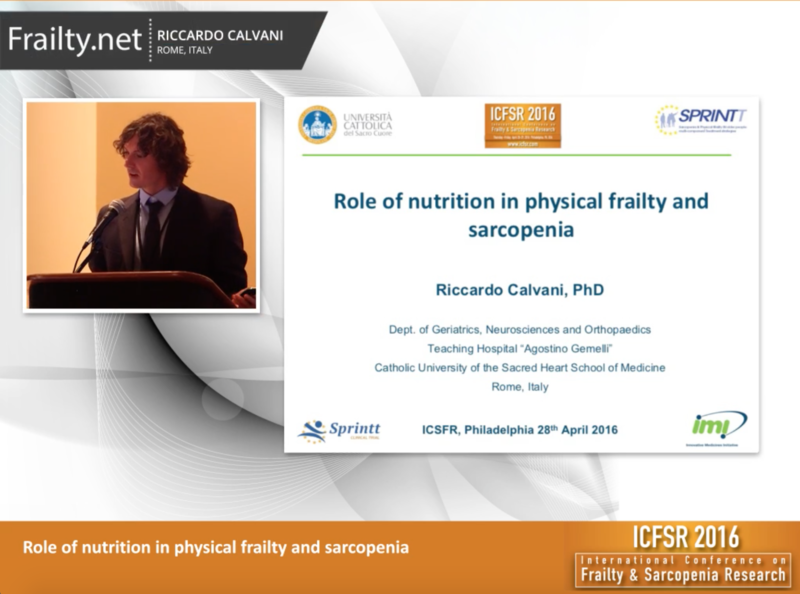 Riccardo Calvani presenting : “Role of nutrition in physical frailty and sarcopenia”. Introducing the 3rd video presentation from the International Conference on Frailty and Sarcopenia Research In Philadelphia 2016. 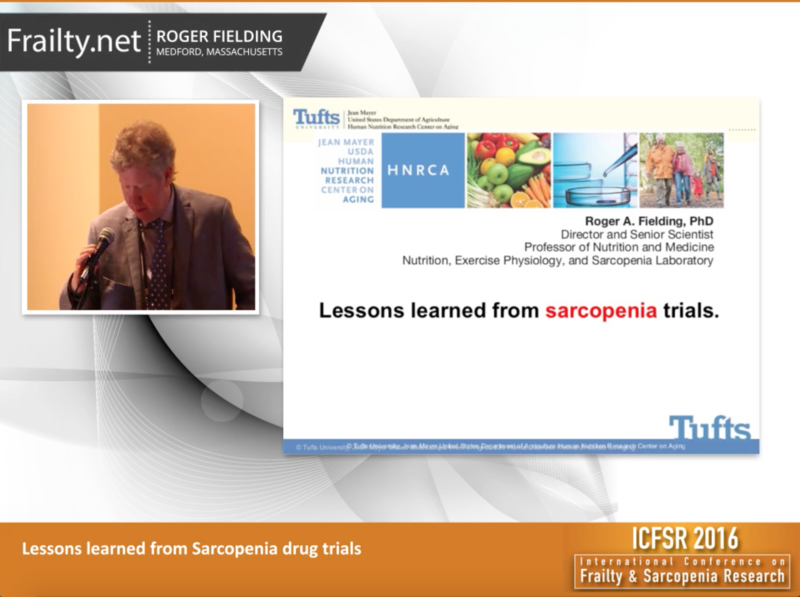 Roger Fielding presenting, Lessons learned from Sarcopenia drug trials. 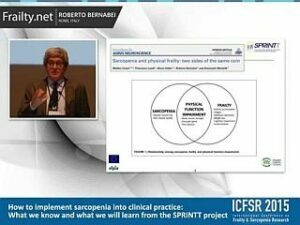 Introducing the 2nd video presentation from the International Conference on Frailty and Sarcopenia Research In Philadelphia 2016. 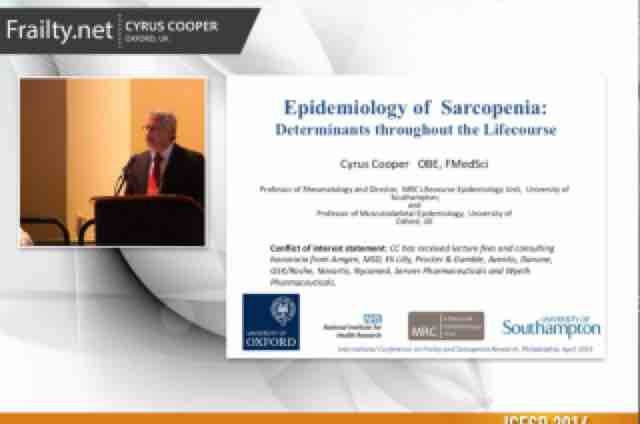 Cyrus Cooper presenting, Epidemiology of Sarcopenia: Determinants throughout the Lifecourse. 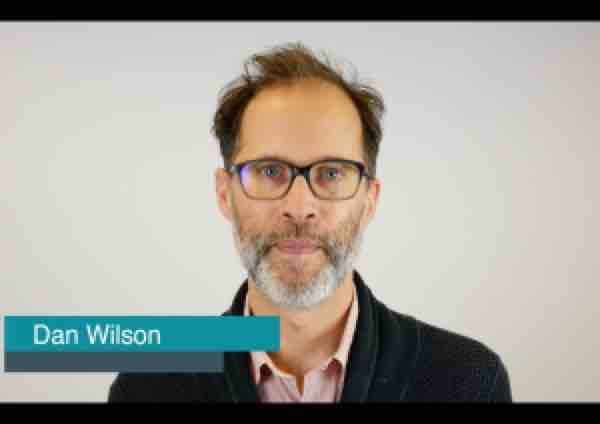 Doctor Dan Wilson, King’s College Hospital, London shares his clinical experience of Frailty in the Heart Failure Unit. Prof John Morley answers questions on how to define and manage frailty. This interview was filmed in Paris during the 8th SCWD Conference, December 2015. 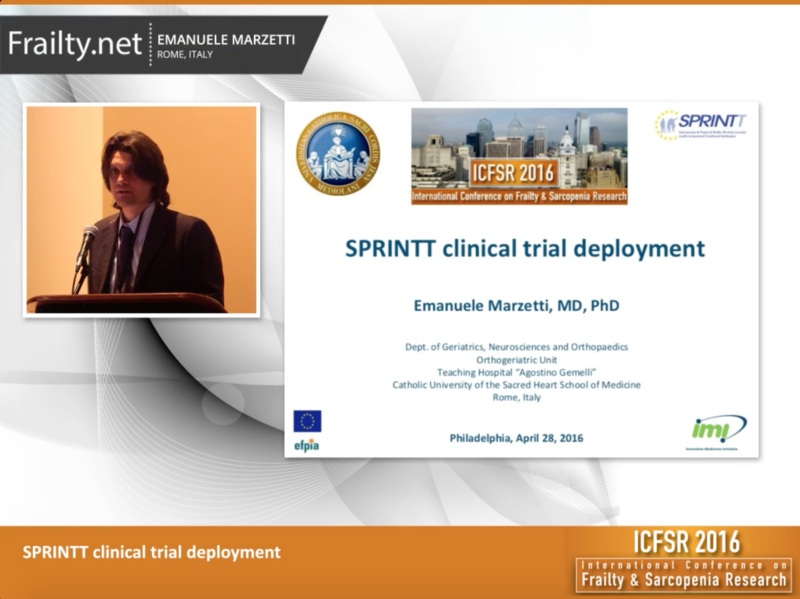 Dr E Marzetti answers questions on the differences between frailty and dismobility and further details on the SPRINTT trial. 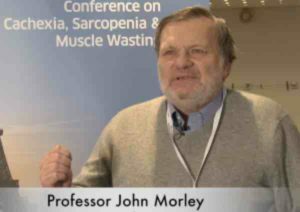 This interview, exclusive to Frailty.net was filmed in Paris during the 8th SCWD Conference, December 2015. 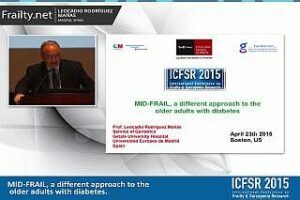 Video of the ICFSR 2015 presentation by Prof. L Rodríguez Mañas entitled “MID-FRAIL, a different approach to the older adults with diabetes”. 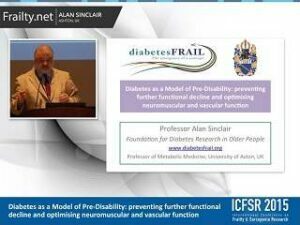 Recording of the talk Prof. Alan Sinclair presented at ICFSR2015, Boston, USA on April 23, 2015. 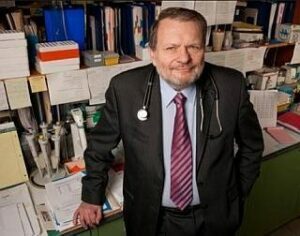 Prof. Alex Mebazza discusses frailty in vulnerable patients with heart failure. 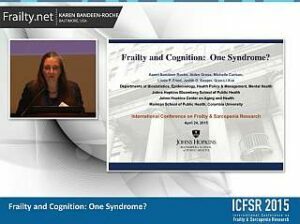 Dr. Karen Bandeen Roche answers the question “Frailty and Cognition: One Syndrome?”. This was presented at ICFSR 2015 in Boston, USA. 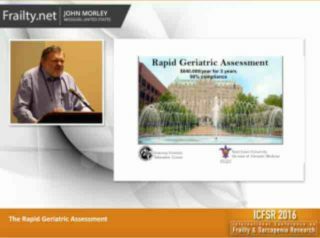 Recording of the talk Prof. John E. Morley presented at ICFSR2015, Boston, USA on April 23, 2015. Video plus powerpoint. 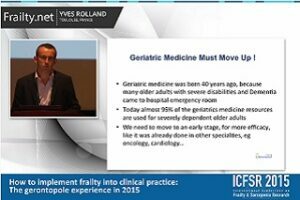 Prof. Yves Rolland presents “How to implement frailty into clinical practice” as seen at the International Conference on Frailty & Sarcopenia Research (ICFSR 2015) in Boston. 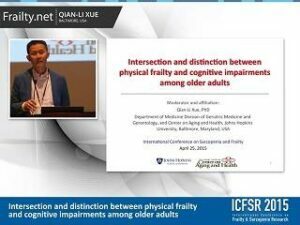 Video of the ICFSR 2015 presentation by Dr Qian-Li Xue entitled “Intersection and distinction between physical frailty and cognitive impairments among older adults”. 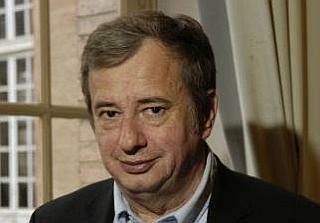 Recording of the talk Prof. Roberto Bernabei presented at ICFSR2015, Boston, USA on April 23, 2015. 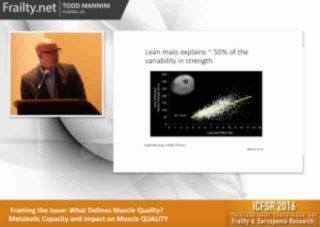 Recording of the talk Dr. Matteo Cesari presented at ICFSR2015, Boston, USA on April 23, 2015. Video plus powerpoint. 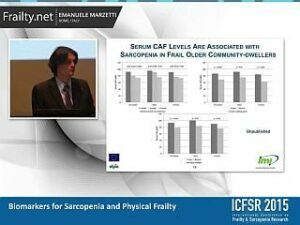 Video of the ICFSR 2015 presentation by Dr. Emanuele Marzetti entitled “Biomarkers for Sarcopenia and Physical Frailty”. 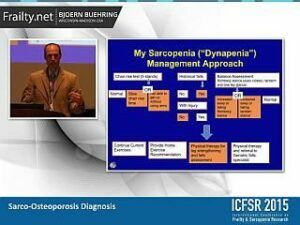 Dr. Bjoern Buehring presents “Sarco-Osteoporosis Diagnosis” as seen at the International Conference on Frailty & Sarcopenia Research (ICFSR 2015) in Boston. 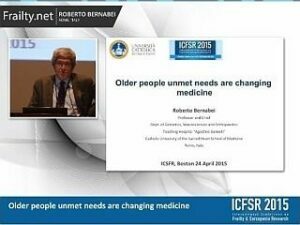 Recording of the talk Prof. Roberto Bernabei presented at ICFSR2015, Boston, USA on April 23, 2015. Video plus powerpoint. 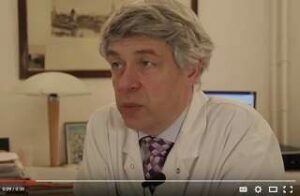 Prof. Ricardo Cappato 2014 Length: 2:03 min Listen to Prof. Ricardo Cappato as he discusses frailty in patients with heart failure. Listen to Dr. Roseline Peluchon as she discusses the general practitioner and frailty.